I can’t believe we are one-third through our six weeks of Bekah’s casting! Thank you all so much for prayers, meals, texts, home visits, emails, phone calls, and sweet gifts. God’s love has been blanketed over our family by the hands of His people. Our family, friends, and church families have been the hands and feet of Jesus over and over again to us. We were at the hospital from Tuesday morning when we went in for her surgery through Saturday late afternoon. The days spent at the hospital we uncomfortable, emotionally wrecking, and spent digesting a slew of medical knowledge. 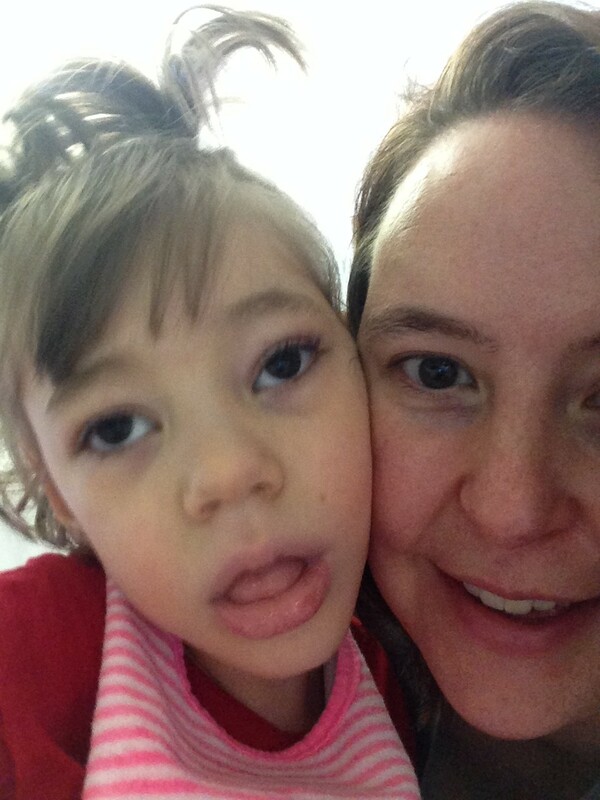 Since being home, we have had better rest and some time to better understand the reality of what Rebekah has gone through. 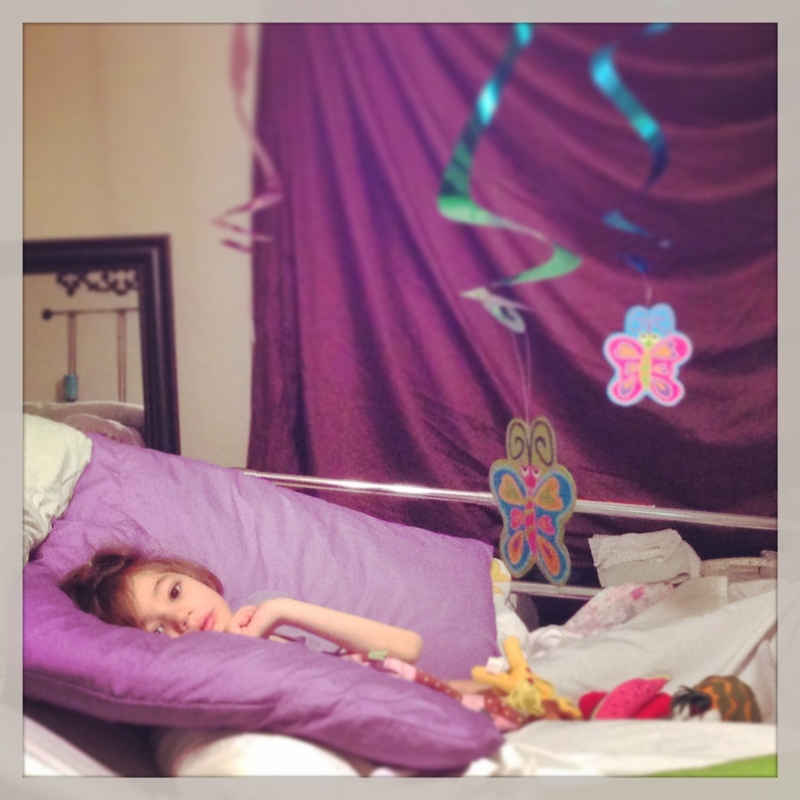 We feel so sad that her routines have been upended and that we aren’t able to scoop her out of the hospital bed and hold her while she is crying (her casts limit her movement, but we have practically crawled up in the bed with her!). We do know that this surgery was the best decision for her and that in the long run, she’ll be better off because of it. 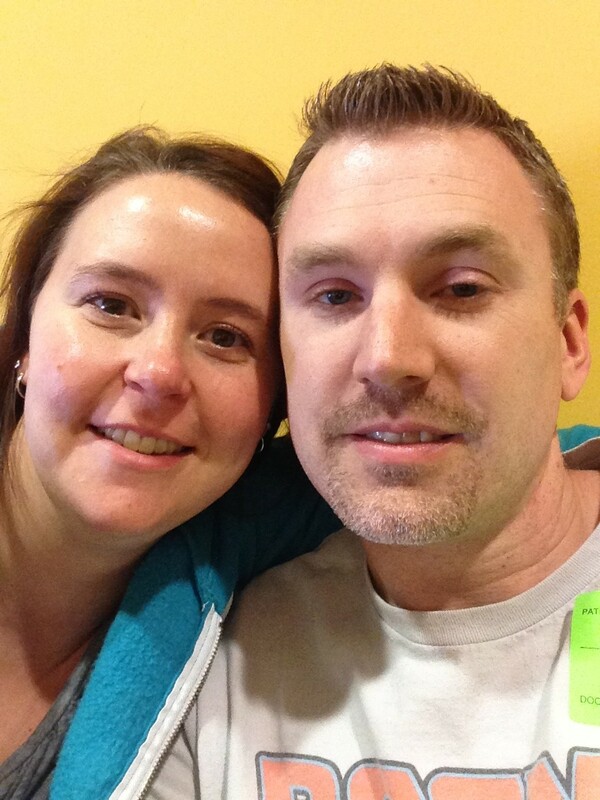 When we went to the hospital on May 13th we had some idea of what was about to happen. We had read blogs and pinned pins about cast care and the realities of a spica cast. While talking to Bekah’s surgeon on Tuesday morning, he told us that he decided a spica cast (from a person’s toes to the top of their chest) would not be most beneficial for Rebekah. He wanted to do short leg casts (from her toes to just below her knee) and then knee immobilizers (from her ankle to the tops of her thighs) on top of the casts. We were a little shocked and a little leery of the capabilities of the short leg casts verses the spica cast which would immobilizer her completely. Because of her involuntary movements and limited understanding of her situation, Dr. De was concerned about Rebekah’s skin integrity inside a spica cast. She could potentially rub sores inside the cast. 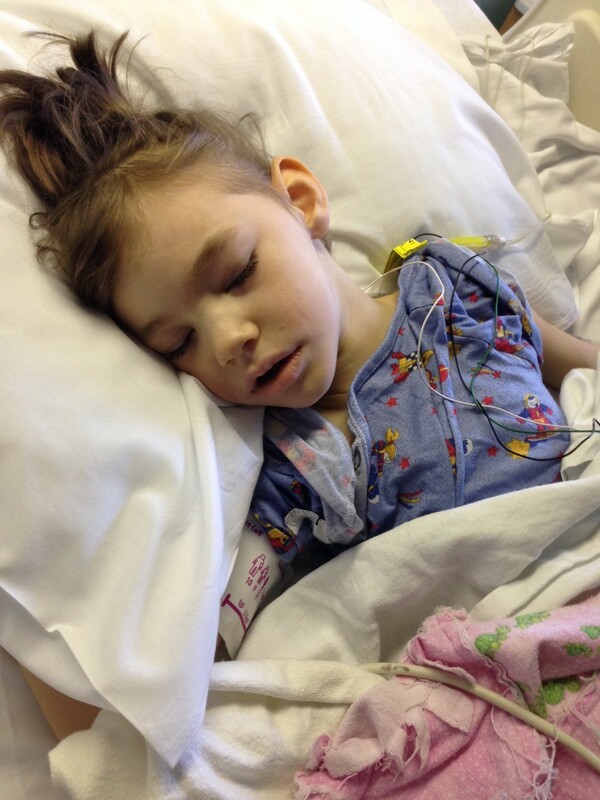 We agreed that we trusted his judgment and knew that we had hundreds of people praying for our girl. Switching gears in our minds was not easy. Chris and I are both planners and like to see the way ahead. Dr. De left us with a plan of care sheet full of his recommendations for follow up and therapy that will be needed once the casts come off. We had some time with the anesthesiologist who explained Rebekah’s epidural to control pain in the days to come (boy, were we thankful for this! 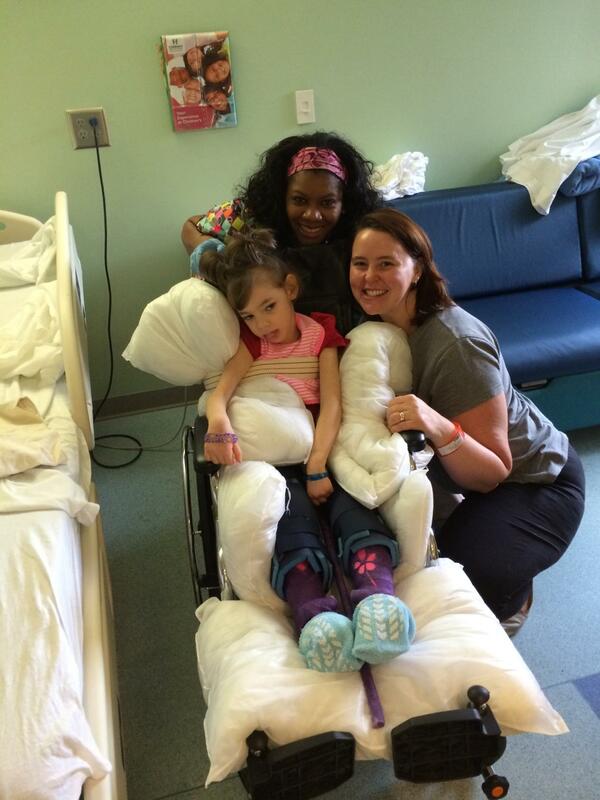 ), and the nurse who would be in charge of Rebekah’s care inside the operating room. Just before she was set to take Rebekah back, we stopped to pray with Bekah. Chris and I each grabbed a hand and the nurse grabbed her leg. Through tears, Chris talked to God about Rebekah and asked for His covering of protection. The nurse prayed with us and reassured us with a big “AMEN!” That sure does good for a mama’s heart! 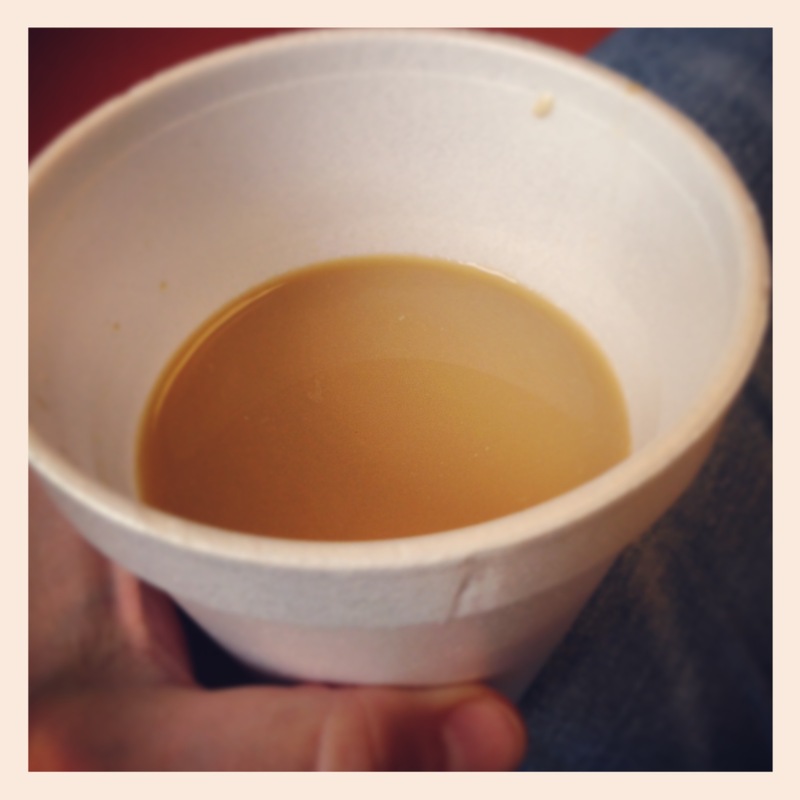 and there was lots of coffee. We knew that the surgery itself would take two to three hours. 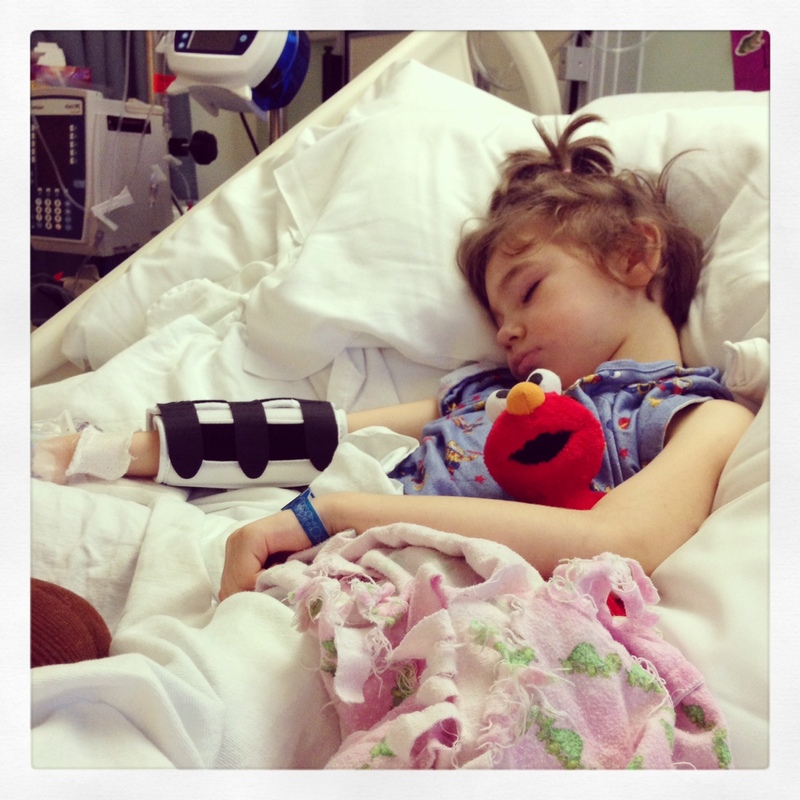 They would also need time for the anesthesia team to work with Bekah before and after. There would be time for the casting. Time for clean up. Time for recovery. Hours and hours of waiting. We saw families in the waiting room come and go. The day surgery waiting area was full for a long time. Slowly, the families all left — they would get a phone call to come back to see their little one or to meet them in their new room. We finally got a call to meet with Dr. De to hear about how Rebekah’s day went. He was so happy about how the surgery went and the outcome for Rebekah. We got to see X-rays of his work and were amazed at the difference. Things were not over for Bekah; he had to go back to begin casting her legs. At 4:00pm the day surgery desk attendant when home. The phones were forwarded to the waiting area and we still waited. Finally, our call came! We hustled over to the fourth floor. 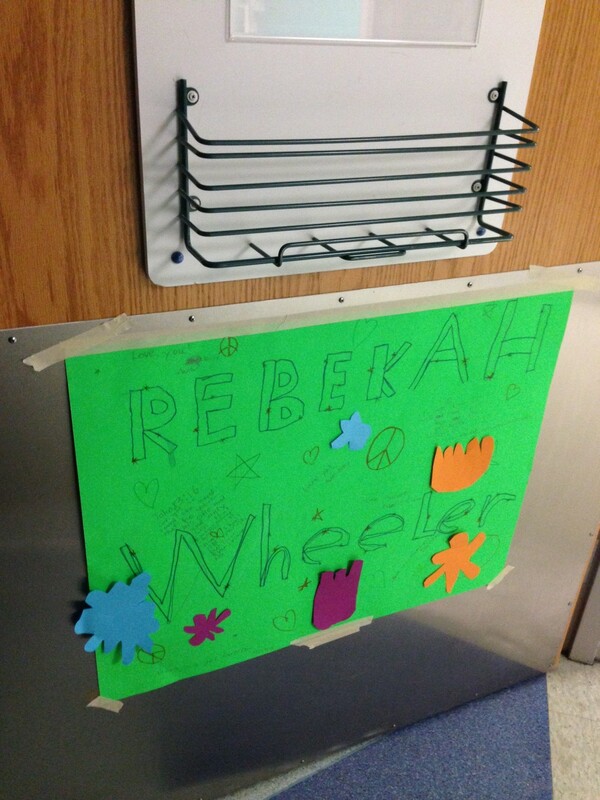 Kayla made a beautiful sign for Bekah’s door! 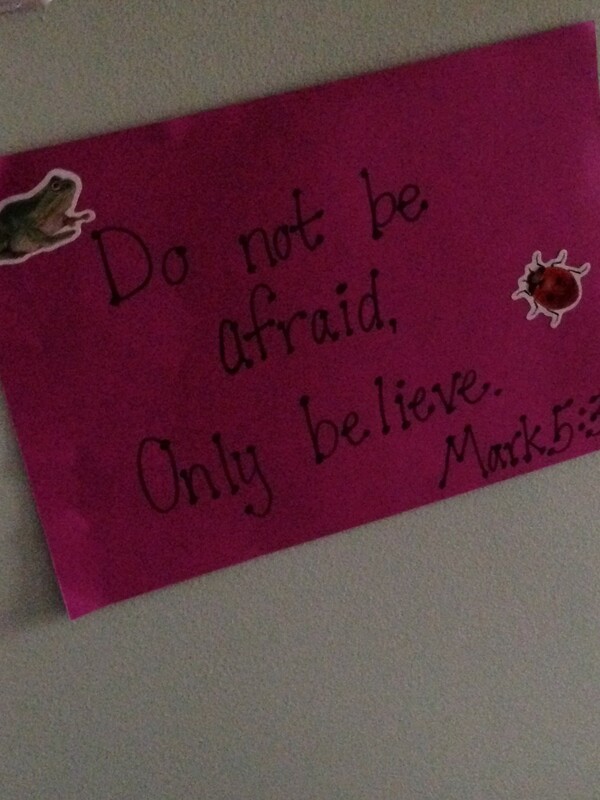 And I made some scriptures for the wall. After a little while, they brought Rebekah and we all got settled in for the next few days. Our girl was very swollen with fluids and still very sleepy. She still had the leads from the monitors in surgery, the blood pressure cuff (stinking thing never works on her!! ), her pulse ox monitor, IV, epidural, and catheter. Rebekah had some wonderful nurses who took such good care of her while we were in the hospital. With loving care, they took care of her little body and our aching hearts. They all knew that she had been with Dr. De because of the special work he did on her casts. What a sweet thing he does for all his patients! Every day, someone from the pain team came to see Rebekah and asses how she was doing with her medications and make recommendations for her care. Rebekah’s IV had to be moved to her right hand because the left side was getting puffy. She was so mad about losing her right hand. She even got the IV tangled in her piggy tails so we had to put an elbow brace on her arm to keep her from pulling the IV out. Someone from Dr. De’s office came by each day as well. If you wanted to talk with any of these doctors, you had to be awake and alert very early in the morning! These guys get to work early! I recommend writing down any questions or observations you have so that you are ready when they get there. Kayla came to see us two days after surgery. Rebekah couldn’t even muster a smile for sister that day. So sad to miss the smiles! 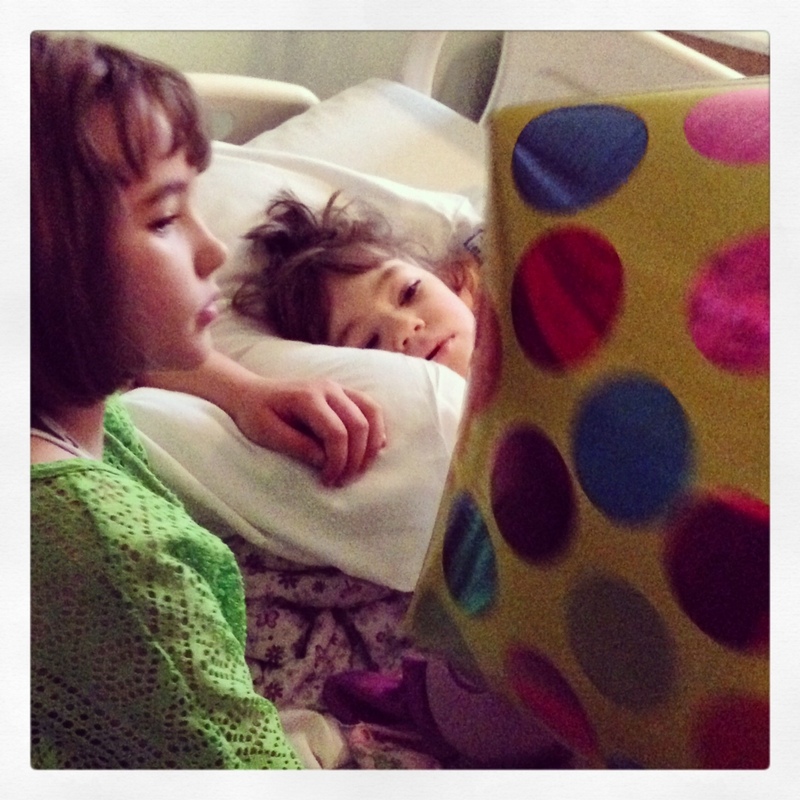 We took some extra days in the hospital because Rebekah was still needing pain meds pretty regularly and was having loose stools. We wanted to be sure that we were comfortable with diapering her, moving her and transferring her from place to place. Sweet drugged up baby girl. 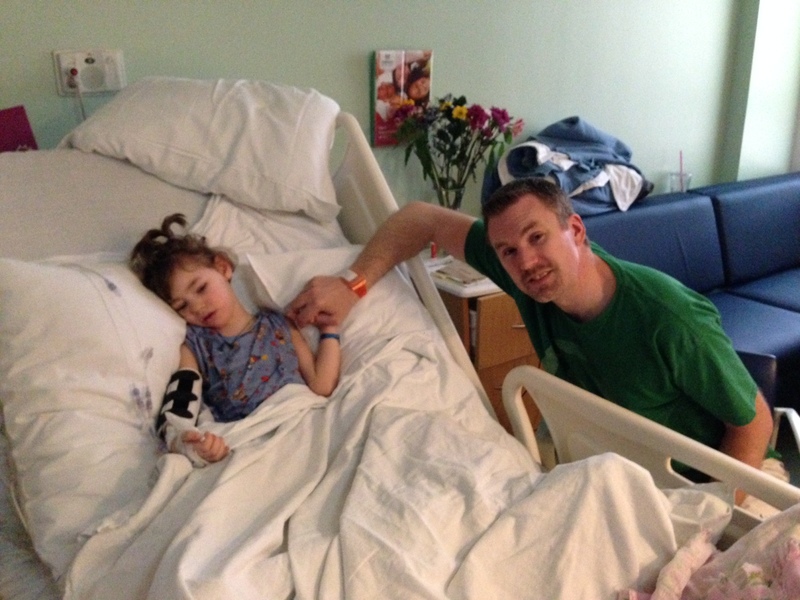 We had also talked with the doctor about having a hospital bed at home for Rebekah. He said that he felt that was a good idea and would make a prescription for the bed. 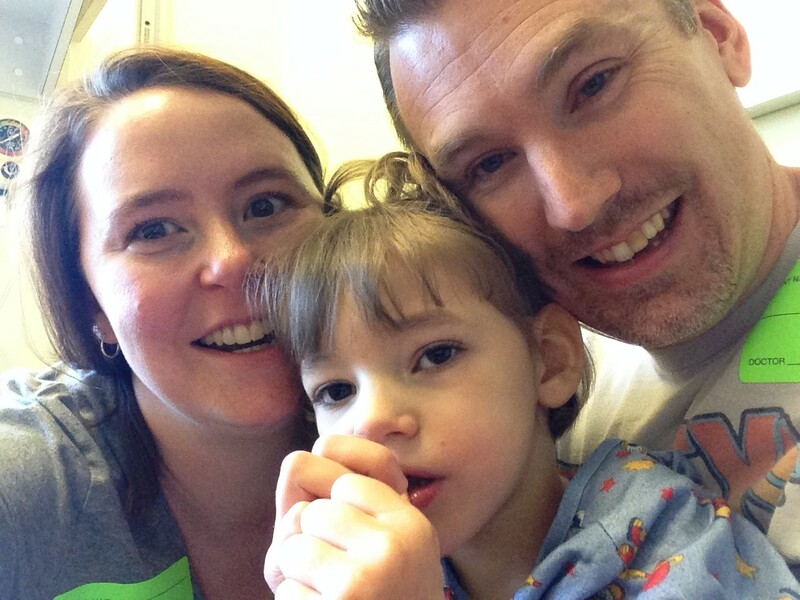 We talked with our nurse and she seemed to discourage us from getting our hopes up. She said that many families have tried but insurance companies simply won’t pay for beds at home. We asked her to talk to the case worker anyway and ask her to file the order. Soon, the case worker called Chris to tell him that she put the order in but that we probably wouldn’t receive the bed. About thirty minutes after that call the hospital room phone rang. It was the medical supply company! They had a bed that they needed to deliver to our home. They needed to know when we wanted them there! Praise the Lord! Chris said “That’s what you get when you have God on your side!” Thank you for those that prayed specifically for this request! We also had a loaner wheelchair with leg props for Bekah and a loaner car seat with low sides so that her legs could remain spread with the bar. Finally, on Saturday afternoon we were ready to go home. Chris loaded up the van (it took a few trips) and we all headed down with the nurse. 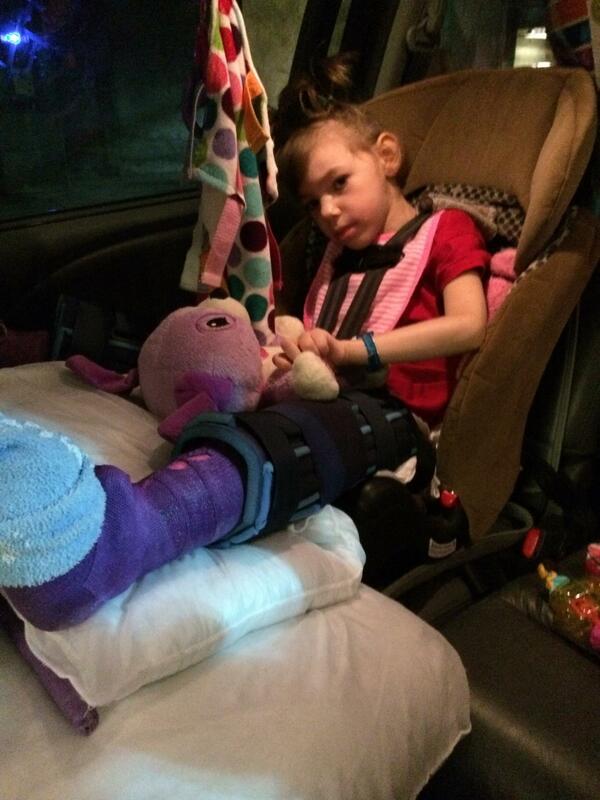 Chris made a platform with pillows for Rebekah’s legs so that she could ride home as comfortably as possible. She was a trooper on the way home, only crying a little bit. We’ve now been home for a little over a week. Thankfully Chris has been able to work from home so that we can all get into a new routine. We’ve been setting our phone alarms and writing everything down so that we won’t miss a dose of medicine or a diaper change. We’ve figured out that Bekah doesn’t especially like valium and have had to cut the dose back a little. She is in super spirits for what all she has been through. We are trying to keep the toys rotating through and the pillows fluffy and comfy. Several people have been bringing us meals and sweet gifts. We’ve just been amazed at the love we’ve been shown. Kayla is a super sister and has climbed right up in bed with Bekah. They read together and watch shows together. 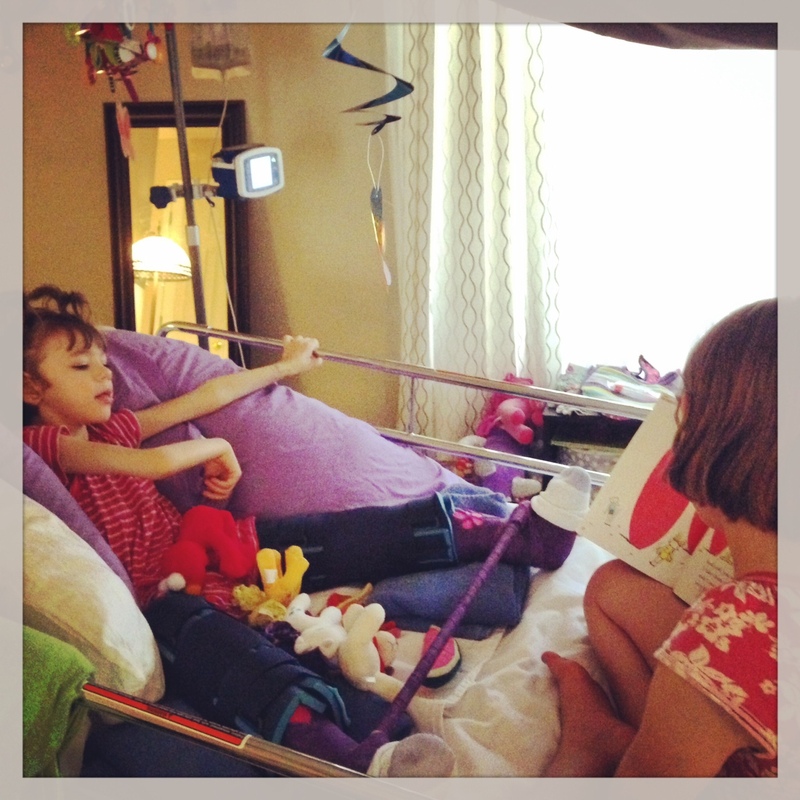 Kayla has even performed a puppet show for Rebekah off the end of the hospital bed for her. I love the way God has knit these two together! Melts me! Chris is heading back to work on Tuesday, May 27th but my sister Liana is here to help me hold down the fort and bring some sister therapy. Chris’s mom is coming when Liana leaves and then my sister Amy will come after that. We are so very thankful for family who can take time out to help us during this leg of the journey. God is so good to us. 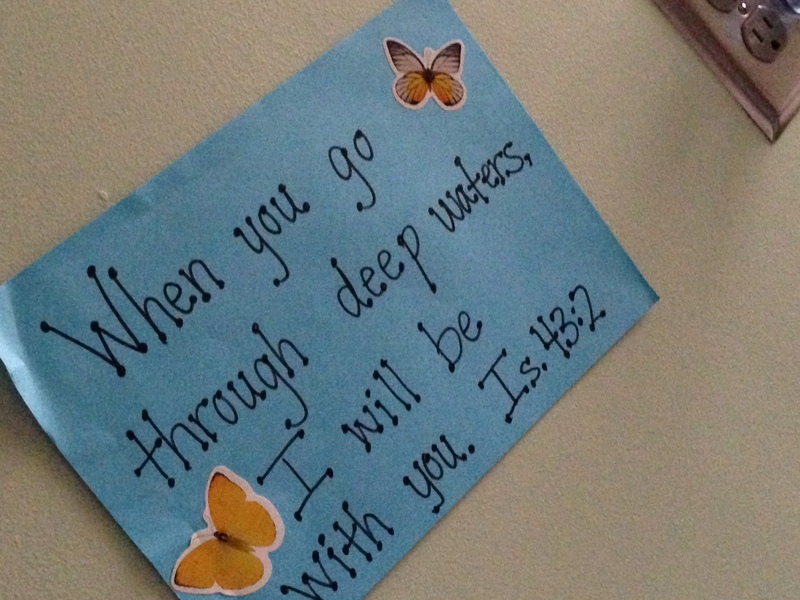 Please pray for Wednesday, May 28th and our recheck with the doctor. They’ll check her wounds and might take some new X-rays. From there, I am guessing we’ll get a date for when Rebekah can have her casts off. Rebekah will be needing range of motion physical therapy several times a week for a few weeks and then once a week for a good part of the fall. We’d love some visitors and appreciate you who are helping to take care of us! Thank you for praying for our family! 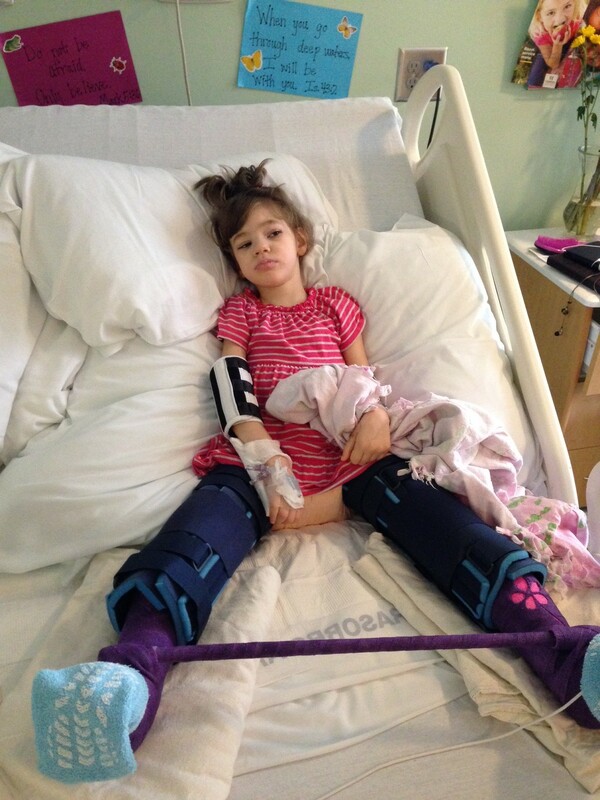 This entry was posted in Rebekah's Updates and tagged cast, double osteotomy, hip, hip dislocation, hip surgery, hips, osteotomy, pediatric surgery, recovery, spica cast, surgery recovery. Bookmark the permalink.